Last time, I presented an FPGA tutorial on how to control the 4-digit 7-segment display on the Basys 3 FPGA board. Full Verilog and VHDL code for displaying a 4-digit number on the 7-segment display of FPGA Basys 3 were also provided. This FPGA tutorial tells you how to interface a mouse with Xilinx Basys 3 FPGA board. 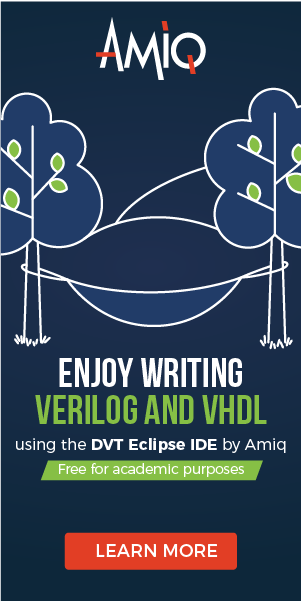 The FPGA tutorial also provides a Verilog code for interfacing a mouse with FPGA Basys 3. The on-board Auxiliary Function Microcontroller PIC24FJ128 allows Basys 3 FPGA to have USB HID host capability. Once the FPGA is programmed, the microcontroller is in USB HID host mode which can interface the FPGA with a mouse or keyboard connected to the USB type-A connector (J2) as shown in the following picture. As illustrated in the picture above, the microcontroller's PS2_CLK and PS2_DAT signals are used to implement a PS/2 interface for communication with a mouse or keyboard. The other signals are to program the FPGA from a USB pen drive connected to the USB-HID port (J2) when the JP1 programming mode jumper is set to "USB". In this FPGA tutorial, we only focus on the PS/2 interface of the onboard microcontroller for communication with a mouse. 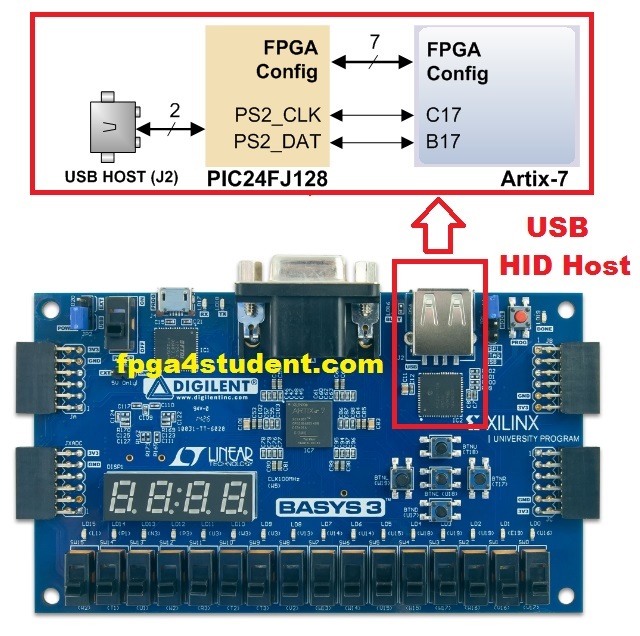 In this case, the microcontroller behaves like a PS/2 bus and a mouse that connected to the USB-HID port can use the two-wire (clock and data) serial bus (PS/2 protocol) to communicate with the FPGA as the host. The mouse sends clock and data signals to the FPGA when it is moved as shown in the following figure; otherwise, these signals are held high. The 11-bit word data includes a ‘0’ start bit, 8 bits of data (LSB first), an odd parity bit, and followed by a ‘1’ stop bit. Three 11-bit words are transferred from the mouse to the FPGA, as shown in the following figure. The three-byte movement data of the mouse include a mouse status byte, X-direction byte, and Y-direction byte. The data are valid only at the falling edge of the clock signal. The X-direction and Y-direction bytes are used to display the relative coordinate of the mouse which moving to the right/left generates positive/negative X and moving to the top/bottom generates positive/negative Y. The XS and YS bits in the mouse status byte are used as the 'sign' bits of the X and Y. The higher the X and Y the faster the speed of the mouse; the XY and YY bits indicate the movement overflow. The L and R bits in the mouse status byte are used to indicate if the Left and Right button of the mouse is pressed. In short, the mouse always sends 33-bit data signals as formatted in the figure above to Basys 3 FPGA whenever the mouse is moved. The Left button click status is shown in the second bit of the data while the third bit indicates the Right button click status of the mouse. The X and Y coordinates are sent from the 13th-to-20th and 24th-to-30th bits of the 33-bit data, respectively. In this FPGA tutorial, a Verilog code for interfacing a mouse with FPGA Basys 3 is presented. Every time the left button of the mouse is clicked, a 4-digit number that is displayed on the 7-segment display of the Basys 3 FPGA Board is increased by one. On the other hand, the right click button of the mouse decrements the displayed number by one. 4'b0000: LED_out = 7'b0000001; // "0"
4'b0001: LED_out = 7'b1001111; // "1"
4'b0010: LED_out = 7'b0010010; // "2"
4'b0011: LED_out = 7'b0000110; // "3"
4'b0100: LED_out = 7'b1001100; // "4"
4'b0101: LED_out = 7'b0100100; // "5"
4'b0110: LED_out = 7'b0100000; // "6"
4'b0111: LED_out = 7'b0001111; // "7"
4'b1000: LED_out = 7'b0000000; // "8"
4'b1001: LED_out = 7'b0000100; // "9"
default: LED_out = 7'b0000001; // "0"
Download the whole Vivado project file: here. Hello, I've uploaded this onto my Basys3 board but it does not work for me. Do you have any recommendations on particular aspects I should be careful with? 1. Make sure you move the mouse while clicking. It is also not working in my case. The display only shows 0.000, when i reset it to be 0.~~~, it still doesn't detect the mouse's displacement. I just uploaded the whole Vivado project file which is demonstrated on FPGA in the video. You can download and try again.